First there was the down-to-the-studs whole house remodel. Taking a neglected, dare I say, abused home and making it fun and functional for our family. And all was right with my world. Then came the front yard. Designing a low maintenance landscape and elevating the eyesore of the neighborhood to something that people would actually stop and photograph; telling us we were an "inspiration," and nicknaming our house the "Art House," (because of all the colors we used from the plants to the decor on the front porch) took many back- breaking, rock-moving, concrete-pouring and sod-installing weeks and weekends. Again, all was right with my world. 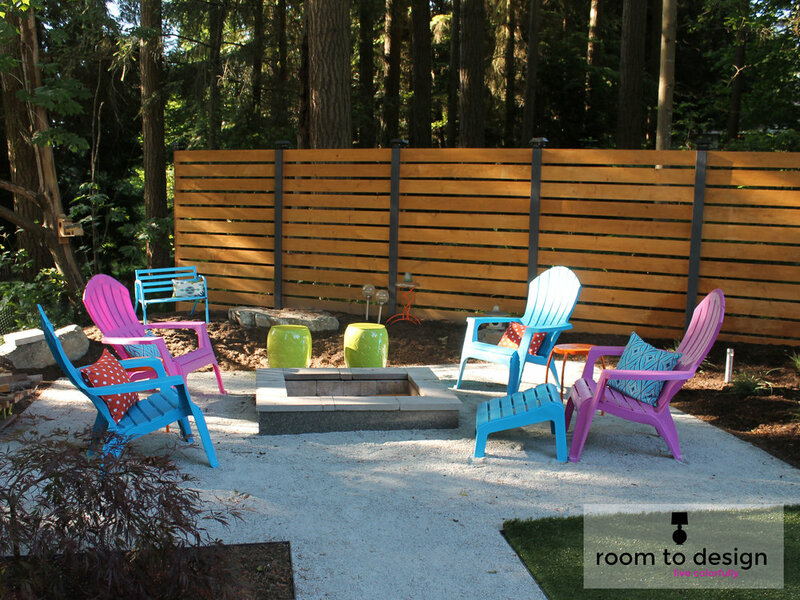 When we started landscaping our back yard, I had big ideas! It needed to be low maintenance and keep with the fun colorful aesthetic of the inside of the house and the front yard. We also had to keep in mind the location of the septic system and the drain field. And then there was, as always the consideration of budget! We would end up using as many materials left over from the renovation as we could, finding creative ways to recycle and upcycle cinder block, brick and granite. In the spirit of reusing materials, I designed a bar to accompany the barbecue area of the back yard. What a better way to use the largest piece of granite! I also thought the recycled cinder block would make great base, giving the bar a modern industrial, unpolished feeling. Again, all seemed right in my world. When we put the fence in, I felt like the bar area was feeling VERY unpolished and extremely unfinished. But we had bigger fish to fry! Last year we put in a pergola to shield from the rain, and more importantly, the pine needles that are the bane of my existence! It's a wonder that the trees have any needles left on them. Now, the cinder block base of the bar looked crude and didn't feel like it belonged with the rest of the yard. It was sad and wanted to be like the other the finished elements at the party. With budget in mind, we would be using leftover materials from the fence project. I knew I wanted to replicate the same spacing we used on the fence, so we decided to paint the cinder block black so the gray wouldn't be visible. A couple of coats of black spray paint (again, something we had on hand) did the trick. My hubs cut the boards to length. Leaving spaces between each board, we attached them directly to the cinder block with some liquid nails and some actual nails. If you've read any of my previous blogs, you'll know that my husband is a perfectionist. Since the surface of the cinder blocks wasn't uniform, the boards were uneven in the corners where they met. This made him very unhappy. Sometimes, his perfectionism leads to great solutions. Here the solution was to finish the corners with boards that he ripped into one and half inch strips, nailed them together and used them to wrap the corners. It gives the whole project a very finished look. 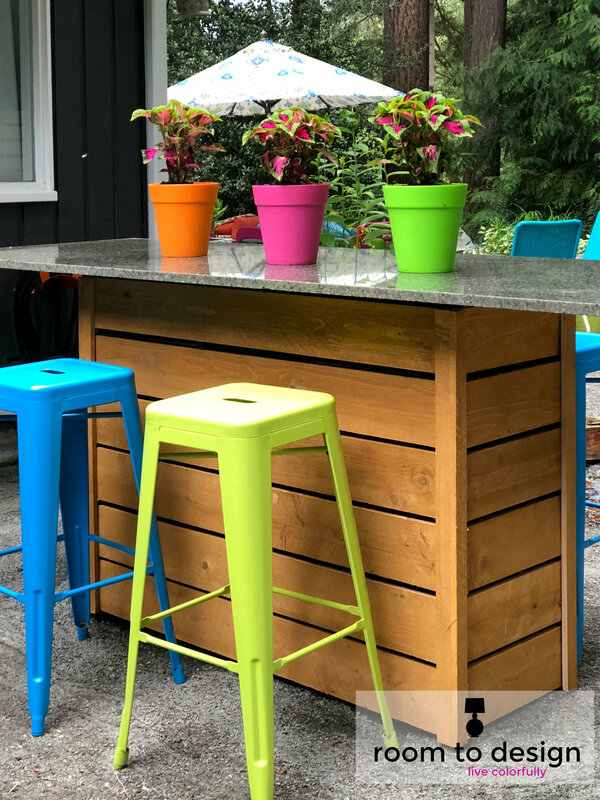 I gave the bar stools a fresh coat of paint, changing the yellow ones to blue because the blue looks much better against the wood. I styled it with colorful pots planted with just as colorful coleus. Now, all is truly right with my world. I have a happy finished bar and anther place to entertain. If you need help making things right in your world, drop me a line. I'm here to help!